Willkommen bei Immer B & B in Lakeside, MUSKEGON, MI. Entdecken Sie die Westküste des Lake Michigan. The Neighborhood: Springen Sie auf Ihr Fahrrad, um die Stadt Lakeside zu besuchen. Dort finden Sie kleine Geschäfte, darunter das Süßigkeiten Emporium, Buchladen, Kino, Convenience-Store, Pubs, Yachthafen, historische Museen und Bootsanleger. Wanderradwege, Golf, Restaurants und die Sandstrände des Lake Michigan. Dieses Haus hat einen offenen Grundriss mit 10ft Decken. In jedem Schlafzimmer hat jedes Bett Memory-Foam-Matratzen aus kühlem Gel ahhh ... für eine gute Nachtruhe. Sie haben alle Töpfe und Pfannen zum Kochen, wollen einen Kuchen backen wir haben auch diese Pfanne. Wir enthalten ein paar Kochgewürze. Wir haben Internet, Kabel, 50-Zoll-Smart-TV. Wir haben auch Fahrräder zur Miete zur Verfügung, bitte kontaktieren Sie uns für die Verfügbarkeit, oder wenn Sie Eisausrüstung benötigen, haben wir das auch zu mieten. Die Terrasse hinter dem Haus ist fabelhaft für eine Versammlung. Sie werden das ganze Haus während Ihres Aufenthaltes haben. Das Haus hat einen sehr großen Hinterhof, wenn Sie daran denken, Ihr Boot oder Wasserspielzeug für Ihren Urlaub zu bringen und den Platz zum Parken brauchen. Dies ist Ihre Zeit, um Ihren Aufenthalt in unserem Haus zu genießen, aber wenn Sie Fragen oder Probleme haben, können wir in ein paar Minuten da sein. We loved this house. Very cozy feel that made you feel right at home. We loved the place, it was just like the pictures. Everything is modern and such a homely vibe; none of us wanted to leave. The neighborhood was quiet and close to everything. Adorable home, beautifully decorated and exceptionally clean! Our stay in Brenda's home exceeded our expectations. 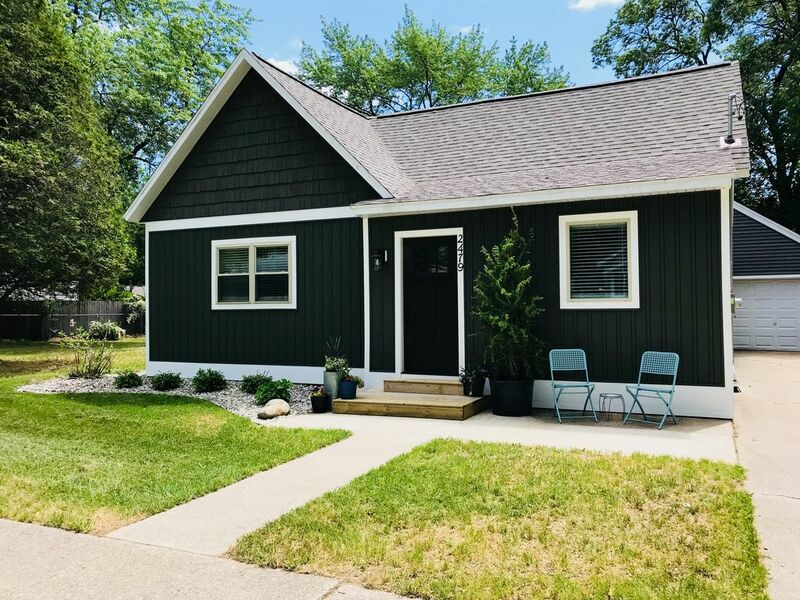 The renovations are so stylish and comfortable, we wish we would have had more time to actually spend at the house during our time in Muskegon. The backyard is perfect for relaxing while you grill dinner on the built-in grill, the kitchen is very well equipped with brand new appliances and cookware. The bedrooms are very comfortable....truly a 5-star property! We will definitely return! Loved this home. My wife and I stayed for the weekend and could not have been happier with the accommodations. Very clean and relaxing. Looking forward to staying here again in the future. The area was very good and it was a quick trip into downtown Muskegon or any surrounding areas. Went to Irish Fest this weekend and location was amazing. This home was spotless and also well equipped. It even had extra paper products such as baggies in various sizes! The pantry had several basic ingredients such as a variety of spices, coffee, and oils/spray.. There was a basket of treats for the kids to enjoy. The wifi password was easily located. The entire home was very tastefully decorated. The beds were very comfortable and the towels fluffy.